Posted by Leilah in Ascension, Christ Consciousness, Collective Consciousness, Creativity, Earth Energies, Expansion and healing, Galactic Center, high vibrational frequencies, One-ness, Spiritual Development, Spiritual Expansion, Unity Consciousness. In the midst of intense energies, self care on every level is so important. Some of us are experiencing a purge right now and it is affecting our energy bodies – physical, emotional, mental and spiritual. And the purge may also be manifesting in our outer lives, which are but a reflection of our inner lives. The last few months have been all about Ho’oponopono, which is a Hawaiian practice for clearing of disharmony within human relationships. It’s about forgiveness and reconciliation and there is a kind of prayer that flows along with this: “I love you, I love myself, I’m sorry, please forgive me, I forgive you, I forgive myself, thank you.” I’ve added a few elements to this prayer, specifically about loving and forgiving myself, which, I feel, is essential to healing of the wound of self hatred that Humanity has been carrying for thousands of years. This energy of forgiveness of self and others is something we’ve been playing with for a long time and it is continuing on ever-deeper levels. Our clearing process moves us into deeper harmony with ourselves and places us in right relationship with our environment and one another. Memories from the past have been coming to the surface. I feel I have been writing about this for years, but so it goes, as we experience deeper levels of clearing. Memories that seem like “minor” incidents have popped into my head for forgiveness and clearing and I have realized that if I’m still regretting something, however small, it will come up for reconciliation. The current planetary alignments, Grand Cross and eclipses that we are journeying through at this time are influencing volatile circumstances in our lives or in the lives of those around us. Had any meltdowns lately? Remember the expression: “Breakdown to Breakthrough” and be gentle with yourselves. Practice ho’oponopono when necessary. What isn’t our truth that we have been holding onto is becoming too hot to hold anymore. That is the blessing of the energetics of change that we are in at this time. We need to acknowledge that which we have been ignoring or hiding from and open to receive the gift of honoring ourselves. That is the breath of fresh air, the expansion, the moment when we fill ourselves with our own pure energetic vibration, unencumbered by false beliefs and patterns that we have gathered to us throughout our lives in order to comply with the cultural circumstance we were born into. It seems that each time we go through a period of change that has been hyped up (think December 21, 2012), and the Big Disaster doesn’t happen, there is another possible disaster that replaces it. I recall a few months ago (I think it was in November 2013) there was a big flutter of concern going through Facebook that the US government was going to shut down the power throughout the country for four days as a kind of “fire drill” to see how people and municipalities would respond. There was a building concern that the US would be left vulnerable to attack and take-over by a certain country. For about 4 weeks this “OMG the sky is falling” possible disaster was hyped up and of course on the big day…nothing happened. And yet there always seems to be something else – some other theory or “possibility” that comes up that generates fear and vulnerability and helplessness. The latest one I’ve heard about is the Yellowstone Caldera – a huge volcano that could blow and the result would be a nuclear winter for the entire planet. Why do we keep doing this? I see two possible answers – ONE is that we want change, big change… we want to be free from the fear and monetary enslavement that we are under and maybe we feel that a big disaster is the only way to create that change. The SECOND thing is fear of death – or unacceptance of death. Basically, like Jim Morrison said, “Nobody gets out of here alive.” We are going to leave these bodies we are in at some point – that is part of our journey of consciousness. It could happen by the Yellowstone Caldera blowing up or by stepping on a rake! The thing is, we are so much more than these bodies we are in – our energy and consciousness is so vast and … we don’t really die. WE DON’T REALLY DIE. We are the Creators. The life force energy from Creator Source (wherever, whatever that is) flows indiscriminately through the All of the All. It simply is. And we are that Divine Is-ness. We are given the gift of this creative life force energy – through the life and the body we are in right now. When we forgive and soften to ourselves and one another, and we come to know ourselves as Divinely connected in Spirit to one another, the energy generated from that knowing moves out from each of us like a wave of joy… the Golden Wave is our co-creation flowing through the Collective Consciousness, calling all to rise up and BE in the fullness of our truth..
It’s like we are standing surrounded by gifts and we don’t even see them – because we have had our own hands over our eyes, believing in the shadow instead of the light that shines through us as we create the shadow play. We can create anything. And so that Golden Wave of love and joy that flows through us – through the Consciousness of Humanity when we are simply BEing ourselves – that is what changes our world. The indiscriminate life force energy that flows through all is a gift for us to play with. Our gift to the world is to add love to that energy, creating the Love-force energy and witnessing that energy expanding into joy, bliss, ecstasy, as we live and create from our hearts. We are on the threshold of something so wondrous and amazing. We can shake off the fear and dance in the surprise and wonder of this miracle we are co-creating. Know, too, that anything that comes up for release – whether it be a “minor memory” or a relationship or job or way of living – is actually creating a new pathway that is paved with our heart-truth and leads to our joy and bliss. Much love and joy to all. Copyright © 2014 by Nancy Wallace Ward and Smote Hill Press. All rights reserved for IMAGES and written material. Permission is granted to freely redistribute this article as long as the author’s name and website http://www.soultransitions.com are included. Posted by Leilah in Ascension, Expansion and healing, Spiritual Development, Spiritual Expansion. Continuing with the feelings of ennui and urgency, February has been a month of turning inside out and shining Light on parts of ourselves that we’ve kept in the dark. This has rendered me frozen in place at times or swirling within whirlpools of emotion. Welcome to the 4th dimension! Expanding with the tide, a wave has turned, come to completion and is spreading its energy across the sand. I feel this within me. The essence of my life expanding with a sigh across the pebbles and shells of long ago experiences, stirring memories, currents of emotions, all of my experience in this life so far. Feelings and memories that have been integrated, softened with love, tenderness, tears of release, all coming up once again, like mist rising from the sand. Not for review. Not for further exploration, just to be in the light of my conscious loving energy. Raw feelings, opening the tenderest places within my experience are triggered, and I realize that all I am to do is love everything that comes up within me. During this process at the deepest moments of the remembrance of pain, I feel another energy rising within me. It is my expanded self; feeling like a goddess, a wise, loving mother, witnessing the pain with absolutely no judgment. Holding the energy of my life in a sacred chalice, I feel reverence, and a deeper sense of love and acceptance than I’ve ever known. All of these facets – aspects of my Self – shine and shimmer in the light of awareness. This expanded self is vast; it feels like the “real” me. And then I come to a realization that as we continue to expand through the influence of the high frequencies of energy that are coming to us from the Cosmos, we are rising into our multidimensionality and the past as we remember it becomes simply a story. And at this time we have so much support for letting go of our stories. The emotions and thought forms of the past are being stirred by the golden wave of light – washing through our being – showing us the parts of ourselves that simply need more love. We are being shown the deepest aspects of our pain – the dark places we have repressed and fought to push away, now revealing themselves for us to envelop in love. No matter how we have tried, these emotions and thoughts cannot be denied. They have been cast out, abandoned by ourselves and they are coming home. Welcome them back into your heart. We are born into this world and when we are small, wide open to it all, the world is described to us. We accept what we’re told and begin to walk within the thought forms and beliefs that are handed down through generations. We take on the description of “reality” with its limitations and disappointments and often this involves invalidation of our authentic selves. But the thing is that we agree… we make an agreement to invalidate our own authenticity. As we accept the descriptions of the world – the global story and our own personal family story – the mental and emotional energy filters into our beliefs. We take on this dense energy layer by layer, until we are wearing a heavy blanket or overcoat of stories and beliefs, which we then present to the world as our own. 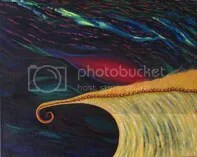 I see an overcoat lined with wiggling tentacles and as we put it on, the tentacles reach in and become part of our organic body, feeding us with the energy of that which invalidates our soul’s truth. It is very heavy, this shroud. Its density weighs on us and feeds us with disempowerment, fear, depression. This energy is not only from this lifetime but it contains the thought forms and beliefs that suppressed our ancestors and has been kept alive in the collective consciousness of Humanity. We assist this wave by embodying the Light of the resonant frequencies within our energy bodies and also through the collective consciousness, which I like to call the Inner Net. And so we rise with the golden wave and we rise as One Being – the Human Being. When we have compassion for ourselves, we also assist one another in that regard, for the compassion flows with the wave of Christ Consciousness energy throughout the Inner Net. We assist the flow of this energy through loving ourselves. New information is surfacing, through personal insights, new discoveries and teachings. This Golden Wave of truth is affecting everyone in the conscious human family and we are seeing more people awakening to the truth. Including those who have been involved in government operations, corporate enterprises, academic manipulation of science and history, as well as political and religious organizations. Some are beginning to come forward in truth because they can no longer live within the matrix of lies they have participated in or witnessed. Paradigm shifting information is coming to the global family and this information comes in gradual increments and will also come through events that will cause beliefs long held by humanity to come crashing down. Think of it as an energetic golden tidal wave that is wiping out false beliefs and allowing us to rise to the crest of the wave in the joy of newfound freedom. We will come to see how powerful we truly are. Humanity and the Earth is being re-born. The Golden Wave of energy washes through all of us, offering us an opportunity to let go of our stories. There may be a little anxiety in letting go. After all, this is part of how we have identified ourselves. We “think” this is who we are. But there is so much more. As we let go of the heaviness of the past, we rise, like the spray on top of a wave, we rise, sparkling in the sunlight, and we integrate with the ocean of consciousness, we integrate with one another, coming into the experience of Unity. In increments, little by little, we experience a gradual awakening, which includes strong surges of energy that push us into new pathways of knowing. There is a pulsation of energy from the Universe – from a place beyond words – Divine Source. This energy is the Crystalline Energy of Christ Consciousness and it is pulsing into the sun, and the sun is pulsing it into the earth, increasing the heartbeat of the earth. It would be of great assistance to us if we could find that vibration, and allow ourselves to vibrate with the pulsation, or heartbeat of the earth. How do we do this? Taking moments to connect with the Earth energy – when I think of this, I feel my energy spreading through the Earth around me… in addition to sending my grounding cord into the earth, there’s a resonance of spreading out, like the ocean surf as it meets the shore and sinks into the sand. Visualize sending roots of light into the earth. This can be done anywhere – even if you live in a city – the Earth is still there underneath the concrete and subway system. It helps to connect with trees – to put your spine against a tree and feel the roots going down, as you are surrounded in the aura of the tree. We are sharing this Earth with all the other life forms here, we are sharing consciousness with one another and we are expanding out into the Universe. This energy is everywhere and is vibrating within our Spirit Body. To help integrate it further, we can consciously receive it through a chakra that exists above our heart in the center of our chest at the Thymus Gland. This has been called the High Heart Chakra. When we open to receive this energy it flows through our physical body. We can consciously flow it through every cell in our body and radiate it out into our emotional and mental bodies and then into our Spirit Body – these are the layers of our energy field. Our spirit body – that part of our energetic field that is furthest away from our physical (about an arm’s distance out) helps to draw the energy through the other layers of our field to maintain coherence with this resonance. This raises our vibration and lifts us onto the top of the Golden Wave. We, the Human Being, are experiencing this together, because we are One, we are not separate from one another. We are rising into and moving towards a moment of Awakening… a Conscious Awakening. It will help us to practice feeling ourselves in a state of well-being. To practice the feeling of light-heartedness. To keep our hearts light as a feather. To witness events – and to witness how we may be triggered by them. This can be challenging, as waves of emotion move through us. Are you noticing some people flipping out in anger and lashing out at others? Do you feel the rising tide of anger moving through you at times? It can be very challenging for us to maintain our center when surges of emotion move through us or those we are in contact with. All kinds of emotions get triggered within us and so it helps to witness ourselves during these moments and know it’s an opportunity for us to love ourselves through the experience. Sometimes this awareness may not occur when we’re in the center of the storm, but when the air clears, we can hold the unloved aspects of ourselves that have been revealed as if we are holding an infant, with compassion. It’s like a storm blowing through and removing all our defenses so that we can see the orphaned parts of ourselves that are asking us to simply love them. Humanity is at a turning point in growth – the old clothes and shoes have gotten way too tight and are splitting at the seams. Buttons popping off, in all directions as we stretch ourselves into expanded awareness of thought and feeling. Telepathic abilities are coming to be known and understood more deeply. What we call synchronicity are moments of co-creation with one another. Truths about the history of humanity are being revealed, truths about the capabilities of the human being are coming into our awareness. We are outgrowing our belief systems. This is happening, whether or not we try to hold onto the old ideas and beliefs, a new age of awareness is dawning. This is the age of awakening. This is the golden wave, it is here and it is our choice to move with the energy or try to maintain the status quo, which is dissolving. Oh it’s a joyful and exciting time to be alive on earth. I want to learn not to take things so seriously, to feel myself surfing this golden wave and to celebrate gratitude in every moment. May we receive the light and radiate! Sharing Consciousness, we rise together. Copyright © 2012 by Nancy Wallace Ward and Smote Hill Press. All rights reserved. Permission is granted to freely redistribute this article as long as the author’s name and website http://www.soultransitions.com are included.